How can your business be successful in China? China is fast becoming the World’s largest economy, so for many businesses in the west its the right time to find out how they can do business with the far east. 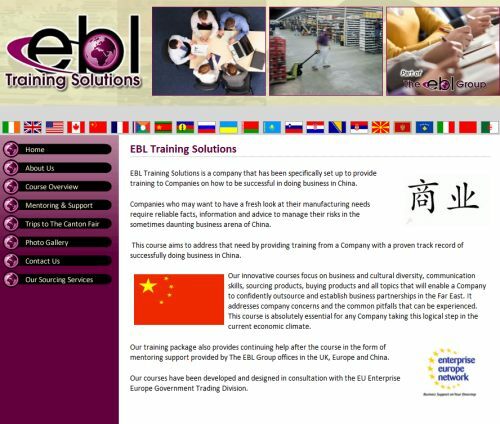 EBL Training Solutions has been specifically set up to provide training to Companies on how to be successful in doing business in China. The innovative courses focus on business and cultural diversity, communication skills, sourcing products, buying products and all topics that will enable a Company to confidently outsource and establish business partnerships in the Far East. We have provided a website solution for the business to promote various services including mentoring and assisting with site visits to China.